It was a perfect summer day as the Expect Miracles East Coast Classic entered its 17th year. The Foundation welcomed over 400 golfers to Pinehills Golf Club and Indian Pond Country Club on June 16th for this much anticipated charity golf outing. The weather was picture perfect and it was a great day in our journey to find a cure! Expect Miracles Foundation was thrilled to continue its tradition of holding the Kids Golf Clinic, a key component of the Foundation’s cornerstone golf event. Kids between the ages of 5 to 18, who all have been impacted by cancer, were invited to join in the festivities. Click here to read more. 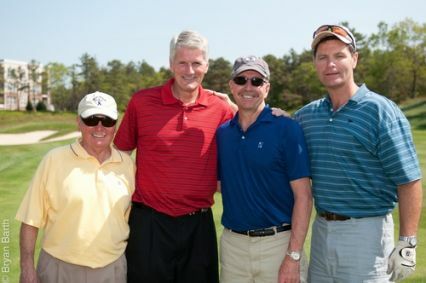 The 2011 East Coast Classic held on June 16th, with Foundation Sponsor Interactive Data Cooperation, was a great day for the financial community to come together and demonstrate their support of the Foundation, while raising funds for a cure. Golfers were treated to an on-course lunch of barbeque fair and after finishing up on the course, headed to Pinehills Golf Club for a cocktail hour and awards reception. In addition to enjoying the beautiful weather, participants had the opportunity to have their pictures taken with Wally The Green Monster and the World Series Trophies. John Dennis, WEEI radio host, was the emcee for the evening and got the crowd energized for the Putting Contest finals, Live auction, and Helicopter Ball drop. The helicopter put on quite a show, circling the driving range and dropping 500 golf balls from the sky. One lucky winner walked away with $2,500 cash PLUS the ultimate Arizona Golf getaway package. Frank Strauss, Founder & Chairman of the Expect Miracles Foundation, presented the evening’s awards. In addition to golf prizes, a few special and deserving awards were handed out. Anthony Kraunelis was awarded a Miracle Maker Award for his consistent support of the foundation, through generous annual donations. The runners on the 2011 Expect Miracles Team were recognized for raising over $52,000 while running the Boston Marathon. In addition, Andrew MacKinlay, a cancer survivor and kids golf clinic participant, addressed the crowd with a few inspirational words as he accepted the Guardian Angel Scholarship as he prepares to attend college in the Fall. At the conclusion of the evening, Frank Strauss was surprised with a custom Red Sox jersey and birthday cake to celebrate his 50th birthday! We were grateful to see both new and old sponsors and attendees at this year’s East Coast Classic. Each year we work hard to make the tournament better than the last, and we couldn’t do it without your unwavering support. We look forward to seeing many of you in CA at the West Coast Classic on September 19th!